If you’re reading this page, we’re hoping that you will help support the Rhino Foods Foundation with seed funding in our first year! Rhino Foods Foundation works to spread innovative workplace practices that stem from a culture of employee centered design–and strengthen business. The Foundation is designed as a separate and symbiotic counterpart to Rhino Foods, Inc.–ensuring that the ideas championed by the Foundation are real world business-tested. While our border mission is to spread innovative workplace practices through a business-to-business model, our primary initiative focuses on employee financial stability and the spreading of the Income Advance Program–a small dollar employee loan and savings tool. The following page outlines the Foundation’s value proposition, year-one initiatives, and proposed revenue model. Scroll down to learn more and/or use the portal the right to donate. If you want to donate by check, please mail to: Rhino Foods Foundation, 79 Industrial Parkway, Burlington, VT 05401. To get things started, Rhino Foods has contributed over $30,000 to date in 2018 (not including in kind hours) to support general operations. Rhino Foods will remain a significant contributor to the Foundation's operations annually, but there's so much more we can do. To that end, during this first year while we get various funding streams up and running, we’re looking to friends, family, and the broader business community to help us launch this non-profit. We strongly believe the time is right and there is a sense of urgency to leverage the opportunities that have presented themselves over the last 6 months. Over the years, Rhino Foods, Inc. has developed, piloted, and refined numerous innovative workplace practices including a small dollar loan and savings program called, Income Advance. News of these practices would often spread within the business community and result in businesses contacting Rhino Foods to learn how to implement the practices at their organizations. The business-to-business contacts reached a peak with the Income Advance Program and inspired Rhino Foods Founder, Ted Castle, to establish the Rhino Foods Foundation as a more proactive champion of these practices within the business community–beginning with the Income Advance Program. Not surprisingly, Americans are turning to alternative credit services. Research by the Pew charitable Trusts and Center for Financial Services Innovations shows that more than 12 million Americans take out payday loans each year, spending $9 billion on loan fees. Millions more rely on subprime credit cards, checking account overdrafts, and expensive forms of credit. A 2016 Federal Reserve Board study showed that nearly half of all Americans (46%) could not afford an unexpected $400 expense unless they borrowed money or sold assets. Similarly, over a third of respondents (34%) in FINRA Investor Education Foundation’s National Financial Capability Study said they probably or certainly could not come up with $2,000 if an unexpected need arose in the next month. The Rhino Foods Foundation is designed as a separate and symbiotic counterpart to Rhino Foods, Inc.–ensuring that the ideas championed by the Foundation are real world business-tested. Income Advance is a small dollar loan and savings program that enables employees to access up to $1000 in 24 hours, no credit check, no questions asked. Income Advance addresses emergency cash needs and builds savings and credit for the long-term. Watch the short video above to learn more about the Income Advance Online Guide we created in partnership with B Lab, the entity that powers the B Corp movement. In Rhino's case, $360k has been borrowed, credit scores have risen, 96% of participants have started saving accounts, and our retention rate increased by 28% in the first 3 years and has remained above the national average ever since. Together with NorthCountry Federal Credit Union, we’ve helped to spread the program to 40+ businesses in Vermont - with a total of $4,731,437 in loans to employees. Income Advance is a small dollar loan and savings program that enables employees to access up to $1000 in 24 hours, no credit check, no questions asked. The loan is repaid through payroll auto-deduction and at the completion of the loan repayment, the deductions continue into a savings account unless the employee opts out. Income Advance addresses emergency cash need and builds savings and credit for the long-term. In order to scale this program, Rhino Foods is partnering with B Lab to expand this program beyond a single company and into the broader market. B Lab is a nonprofit organization that serves a global movement of people using business as a force for good. Its vision is that one day all companies compete not only to be the best in the world, but the best for the world, and society will enjoy prosperity for all for the long term. 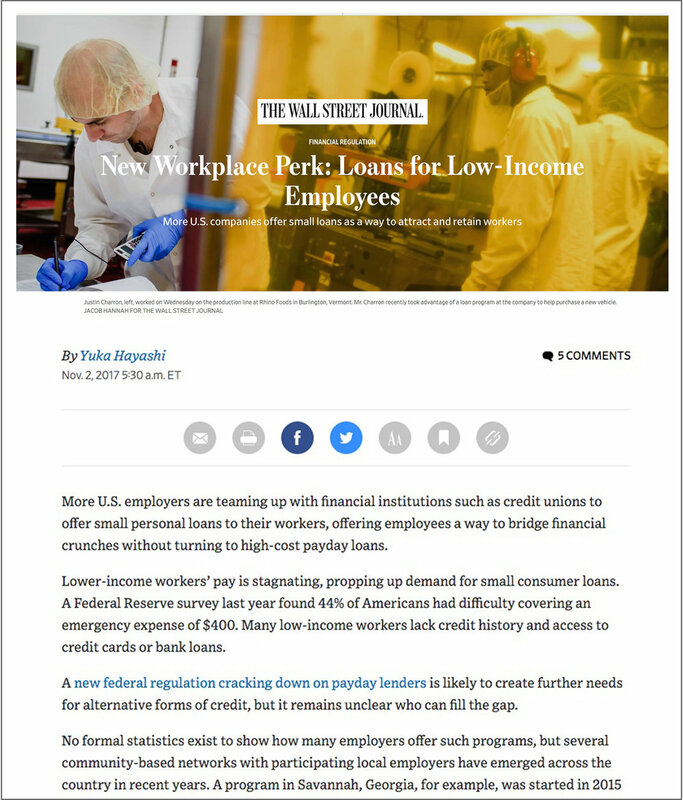 Rhino Foods and the Income Advance Program has been recently featured in the Wall Street Journal and Forbes. Click on the thumbnails below to read the articles. The Rhino Foods Foundation is an independent non-profit organization whose general operating expenses are underwritten by Rhino Foods, Inc. Outreach, technical assistance, and idea spreading will be funded separately through a combination of public/private grants and contributions by individuals, businesses, and other entities that have seen or experienced the impact of our work first-hand. “Pay-It-Forward” We operate on a “Pay-It-Forward” model, wherein anyone can access our learning material free of charge. We ask that all users consider making an optional contribution to help support the continued development, maintenance, and spreading of these materials to others and to be part of an ecosystem of organizations committed to supporting financial stability. “Earned Revenue” We provide technical assistance to entities interested in hands-on support beyond the “light touch” technical assistance we provide for our online guide and other free tools. “Grants” The Rhino Foods Foundation is currently pursuing grant funding to provide outreach and technical assistance to businesses to implement the Income Advance Program. We are seeking seed support to provide technical assistance and outreach as the funding steams outlines above come online. Ready to seed? Donate today!